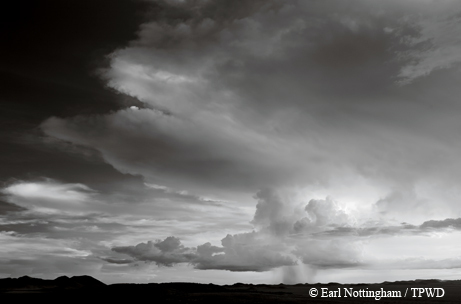 ﻿﻿﻿Clouds and rain become a part of the landscape when late-summer storms move across West Texas. ﻿﻿﻿﻿With less than an hour of daylight left for photography, I sit on a mountaintop with a 360-degree view of the Big Bend region that seems to go on forever. ﻿To my left, the distant Chisos Mountains are cloaked in low-hanging clouds. To my right, across miles of desert flats, the Chinatis and faraway mountains of Mexico are silhouetted by the lowering sun. To the north, with the emerald Davis Mountains as a backdrop, my picture takes shape. I’m entranced by a lone thunderhead building in the distance, waiting for the moment when its statuesque magnificence becomes spotlighted by the last rays of sun. I’m hoping the orchestration of sky, land and light will all play in tune for at least one-100th of a second. Because of the predictable late-summer monsoonal moisture that moves into West Texas from Mexico’s Pacific coast, daily rains and thunderstorms are common, created by the uplifting action of mountain slopes. They transform the normally brown Chihuahuan Desert into a sea of acrylic green with multicolored wildflowers, giving rise to the term “the fifth season.” This short-lived season is the time when epic skies become such a part of the landscape that they seem intertwined in a grand and serendipitous tapestry, changing minute by minute, no two moments ever alike. For the photographer or artist, these infinite combinations of texture and tonality are a visual playground from which to create. ﻿Low-lying clouds settle in after a rainstorm in the Davis Mountains. 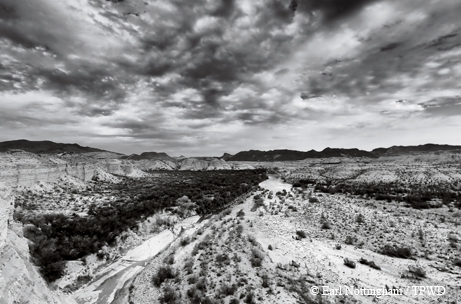 ﻿﻿Terlingua Creek flows near Study Butte as promising skies build overhead. ﻿﻿Gossamer veils of isolated showers move slowly across the flats between Fort Davis and Marfa. ﻿﻿The soft percussion of rolling thunder can be heard for miles. ﻿﻿The thorny ocotillo plant, able to withstand long periods with no moisture, quickly dons a cloak of green leaves and clusters of orange flowers with the first rain. 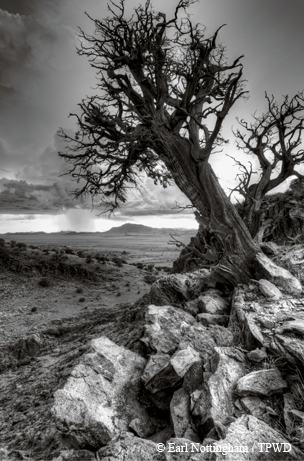 ﻿﻿An ancient juniper clings to the hillside as an evening shower forms in the distance. 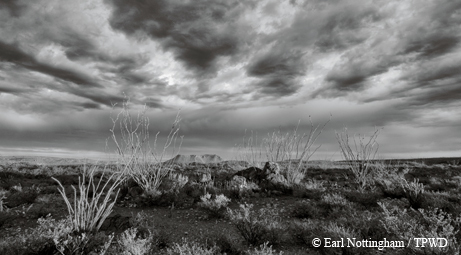 ﻿﻿A passing storm leaves the desert rejuvenated and awash with the scent of creosote. 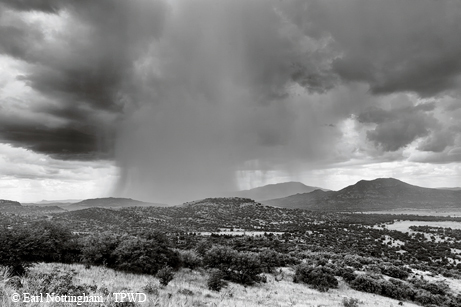 ﻿﻿A shaft of rain glides gracefully through the Davis Mountains.